There is some bad news for the socially connected, new-generation of voters who want to share everything they do with their virtually connected friends: Clicking selfies inside polling booth may land you in jail. A selfie is a relatively new term for older generation; it can be described as a self-clicked photograph of your own self, using the front end of your mobile camera or any digital camera in general. Since last few years, selfies have become very popular with the younger generation as they take self-clicked pictures of themselves in various situations and share them with their friends on social networks. The trend actually gained momentum with Instagram which gradually spread to Facebook and Twitter. During the last Oscars, this selfie taken by Hollywood actors became the most retweeted image ever shared on Twitter. With the involvement of social media and the tremendous hype generated by celebrities, government and the election commission to lure youngsters into polling booths, it was expected that taking selfies would be permitted to spread the message of elections and voting. But election commission had some other plans it seems. As the elections started in Assam on April 7th, election commission issued a diktat that mobiles would be banned inside polling booths, and this killed every hope of a selfie. 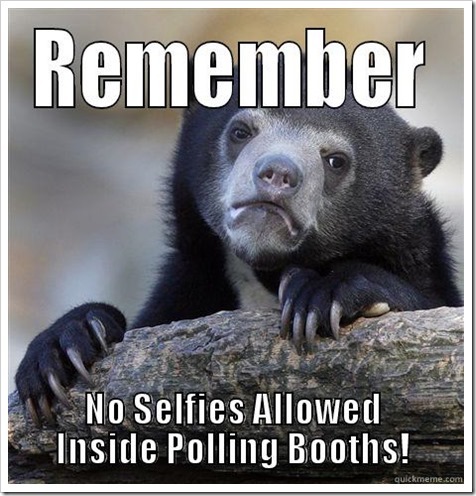 The rules states that you cant take any mobile phone or digital camera inside a polling booth, and hence, can’t take a selfie of yourself casting the vote. As Bangalore is gearing up for the elections on April 17th, youngsters and first time voters were extremely excited and upbeat about the casting their votes and taking selfies inside the polling booth and sharing the hot news with their friends. But election commission has quashed all such plans as they have warned the voters against any such pranks. And, as per “Representation of the People Act”, taking pictures inside the polling booth and sharing them on social networking sites is a violation of rules, which demands jail upto 3 months. First time voters and social media addicts are obviously disappointed by this decision. But it seems election commission is playing it fair here; taking pictures inside the polling booth and then revealing which party you voted for may influence the decision making process of other voters, thereby failing the whole purpose of free and fair elections. Yes, take a selfie with the election mark on your finger, but only after coming out from the polling booth. What are your views on this rule by election commission? Do you think selfies should be allowed? Do share your views by commenting right here!